Navigation on a walking or hiking trip used to be simply about using a map and compass but today a Global Positioning System (GPS) is very much at the forefront as a navigational tool whilst out walking or on any kind of remote wilderness adventure. GPS devices have transcended their original use as a way to travel from A to B in a vehicle and they now come with all kinds of features specific to the task you want to undertake. For hikers, they range from the basic cheaper models which will simply give you your latitude and longitude to far more expensive models jam packed with additional features. It’s therefore important to seek advice from experts before buying as you could end up paying far more for features that you’ll never need to use. A company called ‘Garmin’ probably lead the way when talking about GPS devices specifically designed for walkers and others who engage in outdoor pursuits where navigational skills are important and one of their more popular models with hikers is the eTrex which is light and displays up to 500 ‘waypoints’ which is just a term to describe terrestrial coordinates like latitude, longitude and altitude. Like many other devices, it’s also waterproof which comes in handy for walkers and others who like to spend time in the outdoors where it can often rain suddenly or you may need to cross rivers etc. You should not be swayed by the number of features a particular device has in its locker. Some of these GPS devices contain far more information than you might ever need and, for the untrained, the more information you have at your disposal, the more confusing it can sometimes be. 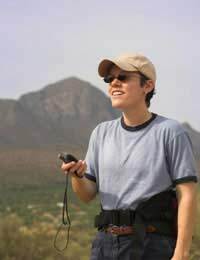 Some devices require you to move your position before they’ll work effectively so, if you require one for walking or hiking, you should look for one that works when you are also in a static position and which can also give you your altitude as this can be very useful when out walking in hilly terrain where contours on a map can sometimes cause confusion. But the important thing is to do your research first. Determine what you want your device to do for you, narrow down your choices and seek advice from an outdoor adventure specialist. Even though the GPS is steadily replacing the old method of navigation using a map and compass, it’s still very useful to carry a compass and to know how to use one. As with most gadgets, there are numerous compasses to choose from and they all come with different price tags. Some are made specifically for those who choose to go orienteering, for example, where they need to be able to obtain clear direction readings whilst running where the compass has to have far more stability. However, for walkers, a simple traditional needle-based compass is quite adequate over, say, a digital compass plus you won’t need to remember to take batteries all the time. Silva is a well established compass manufacturer with a good reputation. Ordnance Survey maps are far and away the most popular choice for walkers and hikers. There are two varieties – ‘Explorer’ and ‘Landranger’. The latter is more commonly used for walking expeditions but the Explorer maps tend to give you far more detail which might be useful if you intend revisiting the same location repeatedly. Harvey’s Maps also give tremendous detail about certain areas in the UK. They include things like the best B&Bs in the area, where to get food and drink and point out places of interest. They’re also produced in a waterproof material too which can be useful. On the downside however, they only really cover the most popular areas in the UK which is no good if you’re hiking in a remote area well away from popular walking tourist hotspots. Call me old-fashioned, but these had held GPS units seem redundant to me. Yes, sat nav is great in a car, but basic map reading and compass skills are hardly rocket science, and something everyone should master before starting off hiking. I’m constantly amazed at the people I see out there with GPS units – more money than time to learn a skill! Even if you have all the new technology, a handheld GPS or something on your phone, you still need to carry a map and compass as a backup and to know how to use them. GPS is great, but it's not infallible, and can go on the blink at the worst times. You need to have a backup with you. On a long hike in bad weather it can end up saving your life, and be a good lesson in not always relying on the new!